At the Anglesey Sea Zoo you can buy Japanese pearls (when available) which naturally come in a range of colours, including the rare blue pearl, as well as a range of pearl jewellery. There have always been myths surrounding the formation of pearls and different cultures have explained them in an amazing variety of ways. The Greeks believed that pearls are created when lightning hits the sea, the Romans, that pearls are mermaids' tears and the Hindus that they are dewdrops that fall at night into the sea. If this happened at a full moon, then the pearl would be perfect. Another story tells how a god selected his adornments from the natural beauties around him. He chose a rainbow halo, a lamp and ruby eyes, but his most prized possession was a pearl as his heart. However rational we are today, there is still a touch of magic in seeing a beautiful pearl coming from the humble oyster. A pearl forms naturally when a small piece of grit or foreign matter gets trapped inside the oyster. The epithelial gland, which secretes nacre or mother of pearl, thinks that the grit is part of the shell and so coats it with mother of pearl as well. This process takes at least a year, and continues until the oyster dies or realises its mistake as the grit or pearl gets larger and larger and is expelled onto the sea bed. Until a century ago, the only way pearls were found was by opening 'wild' oysters or chancing on an expelled pearl. The Japanese entrepreneur Miki Moto worked for nearly 20 years learning how to trick the oyster by insterting a round object to replace the piece of grit. His work gave rise to the cultured pearl industry that now exists. The process of grafting and inserting the round core is very skilled and dominated by the Japanese, although pearl farming has now spread to more than 12 countries. Many species of shell fish will grow pearls, including mussels and clams, but only a few types of oysters produce the gems that are so valuable. The oysters most commonly eaten in Britain, Crassostrea gigas and Ostrea edulis, occasionally produce a white pearl, but it is usually swallowed without the eater's knowledge. The primary species for pearl production is the Japanese oyster (Pinctada martensi) and the Black Lipped oyster (Pinctada margaritefera). Freshwater pearls from Hyviupsis Schlegeli are grown in Japan, China and Korea but these are always smaller and don't have the lustre of the other species. 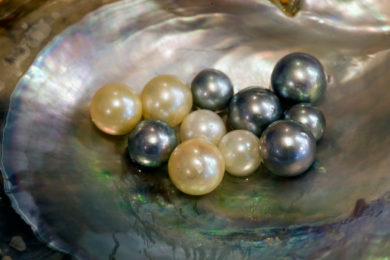 Amazingly, the same species can produce difference coloured pearls. Japanese oysters produce gold, cream, white, silver, blue and rose colours, whilst the Black Lipped oyster of the Pacific produces grey, green, black and 'peacock' colours. The reason behind this is not fully understood, but is usually ascribed to the delicate balance of mineral salts in the growing area which will vary from bay to bay. Lustre or orient - light refracts and reflects from a superb pearl, which will appear almost luminescent. Colour - different cultures value different colours. Far Eastern cultures prefer a yellow-cream or gold, whilst Europeans tend to buy rosy or white pearls. Black pearls are steadily gaining in popularity. Shape - the nearer to a perfect sphere, the better. Surface blemishes - most pearls have a 'birth mark' or small imperfection, the smaller or fewer the better. Size - the larger the pearl, the more valuable it is. Jewellers tend to work with pearls exceeding 8mm, and black pearls may be even bigger. Thankfully, value is ultimately in the eye of the beholder! Over the last century a chain has emerged in each pearl-growing country that leads from the sea to the final 'users', usually women. From grower to grafter, to harvester, to wholesaler, to auctioneer, to craftsperson, to retailer, to jeweller, to buyer, the chain has developed. In both Japan and Tahiti there are different people involved at each stage with hardly anybody being involved all the way through the process. The exceptions are a handful of Japanese companies who, like De Beeres with diamonds, tend to exert a lot of influence on the industry. This industry, which employs tens of thousands of people on the other side of the world, can only be sustained by the extraordinary demand over the centuries for natural beauty. "The great of the world have always had a passion for pearls. Men and women of power, whether mandarins, maharajahs, sheikhs, kings and emperors, queens and empresses, considered them a source of majesty, opulence and power. Match a woman with the right sort of necklace and you will become aware of an imperceptible and subtle change. She will radiate with new charm. One has the impression that every pearl is waiting for the touch of her skin to justify its existence." Pearls have been a sign of fabulous wealth through the ages. Catherine de Medici owned the two most beautiful pearls in Europe, valued at 30-100,000 ducats. The court jeweller explained the disparity because there was no other pearl with which to compare hers. Charles I wore a beautiful pearl in his right ear. At his execution a large crowd gathered, some hoping to take the pearl from the severed head. It disappeared! The Pearl of Asia is the largest in the world at 605 carats or 121 grams. This priceless pearl, said to have belonged to the Emperor of China, now resides in a bank vault, layered in blue silk, in a gold box inside a velvet case, inside a silver case. Diana, Princess of Wales, often wore pearls of the Japanese Akoya Hanadama type (the very best quality). Pearls are often family heirlooms with a fascinating history attached to them. Although the days of debutantes and their 'coming out' pearls are almost over, the allure of pearls will remain everlasting. Pearls have been used as symbols of love and fidelity throughout history. Cleopatra owned two matching pear-shaped or Baroque pearls. To convince Mark Anthony of her love she dissolved one in wine and toasted him. They were valued at 25,000 golden ecus! The Gresham pearl, worth £15,000 in 1600 was ground to powder, dissolved in wine and drunk as a toast to Elizabeth I by Sir Thomas Gresham. History does not relate what Lady Gresham said! In a masterly bluff, Hamlet's step father, King Claudius, dissolved a pearl in a cup of poisoned wine as a 'reward' for his fidelity in Shakespeare's play, Hamlet, Prince of Denmark. King Solomon in Proverbs said, 'Some pearls protect from fever, others bring wealth or love'. Since the late 16th century, the Chinese have used pearls to fight liver and eye infections. In Kashmir they are believed to be an antidote to poison and depression. Various cultures have used them for stomach pain, rheumatic pain and even as an aphrodisiac when mixed with bear liver or opium. One Maharajah believed powdered, burnt pearls, used as snuff, cured headaches, cataracts and ulcers. Pearls are also claimed to strengthen the gums and whiten teeth. Francis Bacon dissolved pearls in lemon to stop fever. there is some truth in the health claims made over the centuries.